Hello! Just a quick message from me. I'm away now for my holiday (I should actually be on the plane when this goes live!) so for the next two weeks I will have guest posts from some lovely ladies, starting with Kat. Enjoy! I'm Kat, also known as @KLEnails. The lovely Becca, who is living it up in America currently, has asked me to write a guest post. Recently I had to great opportunity to collaborate with Ard as Nails to create my very own polish collection. 5 beautiful metallic polishes which are all named after places I have been with my husband. I love every single one them, obviously! So have been using them as much as possible in my nail art recently. Here is my design using the sumptuous Turkish Delight from the aptly named The Euston Collection. Such a pretty floral design! To create this design I started using Turkish Delight from The Euston Collection. It needs one coat. Honestly. One coat. The formula is spot on. It glides on smoothly and seamlessly. Because its super metallic as well its so shiny without a top coat too. Then for the rose pattern I used my Creative Shop stamping set which I purchased from Rainbow Connection and my Mundo De Unhas white stamping polish. 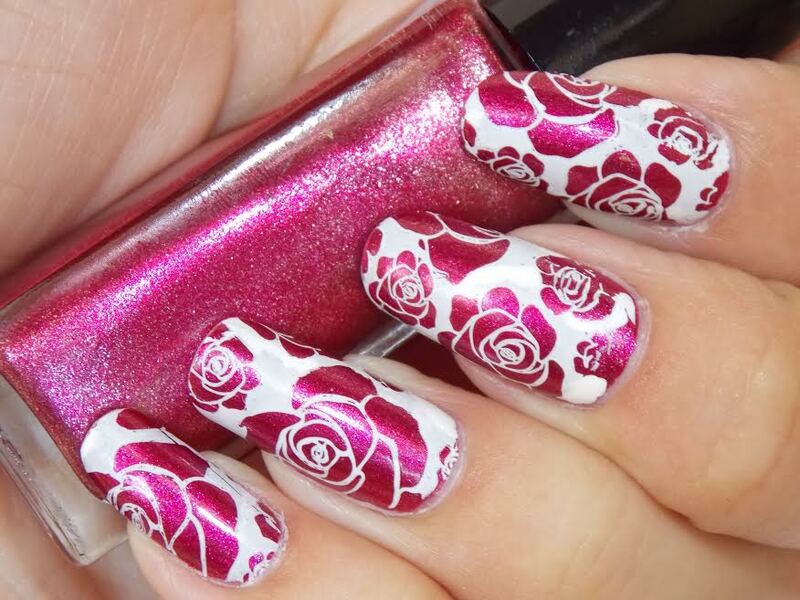 I wanted a full coverage pattern with a large bloomed rose. 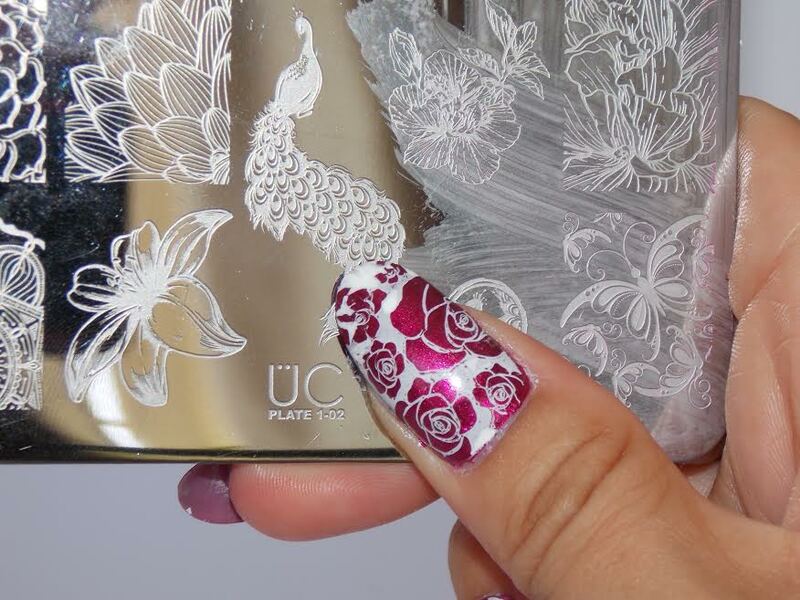 I found the perfect design on one of my Uber Chic stamping plates. This is plate 2 from stamping set 1. As usual with MDU stamping polish it needed a good shake before using it. Due to the formula being a tad thicker than normal polish it can settle and thicken in the bottle. This can affect the quality of the image when scraping and stamping. I did make a few small mistakes so using a Kolinsky hair nail art brush which I purchased from Twinkled T, I added and touched up and corrected any mistakes. Then once dry I used Glisten & Glow's HK Girl topcoat. Overall I was happy with the design. 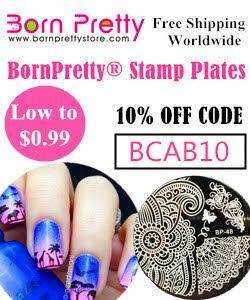 I do need to make sure that I shake the stamping polish before every use. So thank you all for reading! If you fancy checking out my blog the link will be below, you can also find me on Instagram and twitter on @klenails. Thanks for having me Becca! Kat, I love this design. I adore rose nails & this combo is stunning. I like this plates. This combination of colors is so pretty. 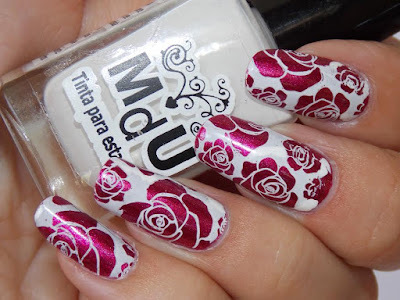 I've recently got a new white gel polish and want to paint roses on it or some other design ( I found a lot on http://nailartstyle.com/top-55-white-acrylic-nails ). Did you try to paint on your nails?